Aim : The effect of different concentrations of hydrogel of sodium ascorbate on bond strength of bleached enamel for varying periods of time and the mode of failure was evaluated. Materials and Methods : Seventy enamel surfaces were obtained from 35 human extracted premolars. Specimens were divided into four groups: no bleaching (control), bleaching with carbamide peroxide gel, bleaching and application of 10% / 20% sodium ascorbate hydrogel for 30, 60, 120 min. Surfaces were bonded with a total etch bonding system and composite resin. Specimens were tested for shear bond strength. Mode of failure was determined by stereomicroscope. Data were analyzed using a two-way analysis of variance, and Scheffe's post hoc test. Results : Sodium ascorbate hydrogel application following bleaching increased the resin-enamel bond strength and was directly proportional to its duration of application. However, there was no difference in bond strength with an increase in the concentration of sodium ascorbate hydrogel. Conclusion : Immediate bonding of composite resin to bleached enamel is possible after treatment with antioxidant sodium ascorbate hydrogel. However, there are limited data at present to support the effect of different concentrations and duration of application of sodium ascorbate hydrogel on bond strength of bleached enamel. Hence, the aim of our study was to evaluate the effect of different concentrations of hydrogel of sodium ascorbate on bond strength of bleached enamel for varying periods of time and to determine the mode of failure at the enamel-resin interface. Thirty-five intact extracted human premolars were selected for the study. Teeth free of caries, cracks, or developmental enamel defects were included. Teeth were stored in 0.1 % thymol solution as it is an antifungal and bacteriostatic. High-speed diamond burs were used to remove roots. Each crown was sectioned to obtain two non-occlusal enamel surfaces and a total of 70 enamel specimens were obtained. A putty silicon mould was made and specimens were mounted in acrylic such that only the enamel surfaces were exposed. Specimens were polished with wet 320-grit silicon carbide paper to prepare standardized flat enamel surfaces for treatment and bonding. The specimens were stored in an incubator at 37° C in 100% relative humidity throughout the experiment. Group A (5): untreated (control group). Group B (5): only bleaching with 17% carbamide peroxide. Group C (30): bleaching with 17% carbamide peroxide followed by application of 10% sodium ascorbate hydrogel. Group D (30): bleaching with 17% carbamide peroxide followed by application of 20% sodium ascorbate hydrogel. In groups C and D, the samples were further subdivided into three subgroups of ten teeth each depending on the duration of application of sodium ascorbate hydrogel. The specimens in groups B, C and D were treated with 17% carbamide peroxide (Perfect Bleach, Voco, Germany) for 8 h a day for 5 days. After completion of daily bleaching procedure, the specimens were thoroughly rinsed with an air-water spray for 30 s and air dried. Carbopol 974P was dispersed in water by constant stirring in an ultrasonic water bath. After the Carbopol 974P was dispersed, ascorbic acid was added and dissolved. Then, sodium hydroxide was added as a neutralizer to thicken the gel. The gels were stored in small airtight bottles. After etching with 35% phosphoric acid (Ultra-etch, Ultradent, South Jordan, Uttah, USA), a total etch adhesive (Adper Single Bond 2, 3M ESPE, St. Paul, MN) was applied to the flattened surface of specimens according to manufacturer`s instructions. A plastic tube with an internal diameter of 2 mm and 2 mm height was applied to bonded specimen prior to curing the adhesive and then light cured for 30 s. The plastic tube was filled with resin composite (Filtek Z350, 3M ESPE, St. Paul, MN) and light cured for 40 s. The tube was left in place throughout the testing process. Samples were examined under a stereomicroscope at 10Χ magnification to evaluate the mode of failure. Type of failure was classified into following categories: adhesive failure (between enamel and bond/ composite and bond); cohesive failures (within the enamel/resin composite) and mixed type. Mean shear bond strengths and standard deviations (SD) recorded in the control and experimental groups are displayed in [Table 1]. Bleaching with carbamide peroxide produced a significant decrease in the bond strength in group B as compared to the control group (A). Comparison between the various groups is summarized in [Table 2]. 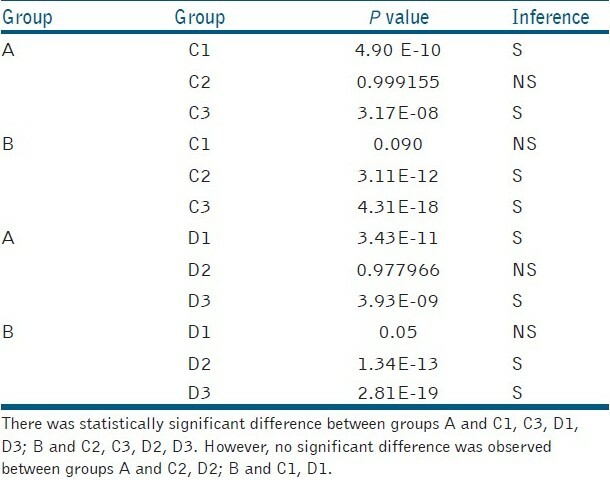 Comparison within the groups C and D are displayed in [Table 3]. Application of sodium ascorbate hydrogel improved the bond strength of composite resin to bleached enamel. There was statistically significant difference between groups A and C1, C3, D1, D3; B and C2, C3, D2, D3. However, no significant difference was observed between groups A and C2, D2; B and C1, D1. The longer the duration of application, the higher the bond strength. At the 30 min application, the bond strengths were significantly lower than the unbleached group (A). However, there was no difference in bond strengths between the sodium ascorbate groups (C1, D1) and the bleached group (B). But at the 60 min application, the bond strengths were higher than the bleached groups (B, C1, D1) and similar to the unbleached group (A). At 120 min application, the bond strengths (C3, D3) were higher than all the other groups. There was no difference; however, with regards to the concentration of sodium ascorbate hydrogel (10%, 20%) at all the time intervals (C, D). All three types of failures (adhesive, cohesive and mixed) were observed in various groups that are summarized in [Table 4]. More of adhesive failures were seen in groups B, C1, D1. However, number of adhesive failures reduced in groups C2, D2, C3, and D3. Premolars extracted for orthodontic purpose were selected so as to have four surfaces for bonding for four groups from same tooth to eliminate bias. The interfaces between resin and bleached enamel as seen on SEM examination are substantially different from those formed between resin and unbleached enamel. In the bleached specimens, large areas of the enamel surface were free of resin. When tags were present, they were fragmented and poorly defined; also, they had penetrated to a lesser depth than in the unbleached controls. The quality of a composite bond is compromised by a smaller number of resin tags. SEM observations suggested an association between a high concentration of voids in the bond area and low mean bond strengths. In another study, SEM examinations of interfaces between resin and bleached enamel displayed a granular and porous aspect with a bubbly appearance. It has been suggested that these might be due to gaseous bubbling, possibly the result of oxidization of peroxide trapped in the subsurface layer of the enamel. , We share the opinion that the bubbly appearance of the resin might be caused by residual oxygen in the enamel structure. Regarding the duration of application of the hydrogel, this study suggests that bond strengths of composite resin to bleached enamel increased with an increase in the duration of application of sodium ascorbate. Lai et al.,  found reversal of bond strengths after the bleached specimens were immersed in 10% sodium ascorbate solution for 3 h. They considered this duration as one-third of the time of application of the bleaching agent. Nevertheless, in some studies , the duration of antioxidant treatment was 10 min, which was considered a reasonable time period for clinical application. However, the findings in our study differ. The application of sodium ascorbate hydrogel for 30 min (C1, D1) increased the bond strength of composite resin to bleached enamel, but it was still less than in the untreated group. The bond strengths in groups C2, D2 (60 min) were similar to that of untreated group. There was significant increase in bond strengths in groups C3, D3 (120 min) when compared to all other groups. Thus, this study suggested that it takes at least 60 min for bond strength to return to pretreatment levels [Table 2] and [Table 3]. It has been demonstrated that peroxide ions take the place of the hydroxyl radicals in the apatite lattice and produce peroxide apatite. In addition, when peroxide ions decompose, substituted hydroxyl radicals re-enter the apatite lattice, resulting in the elimination of the structural aberrations caused by incorporation of the peroxide ions. The incorporation process of peroxide ions might also be reversed by an antioxidant as has been explained earlier. Syprides et al. demonstrated that adhesives containing ethanol and water reversed the decrease in the bond strength in 10% carbamide peroxide treated dentin. In another study that used an alcohol based adhesive, there was no difference between bleached and unbleached enamel in terms of bond strength and using alcohol-based bonding agent made the resin composite application possible immediately after the bleaching process. Ethanol is known to increase the bond strength of enamel by decreasing surface water. Considering these, an ethanol-based bonding agent adper single bond 2 was used in this study. However, we observed that it failed to reverse the effect of the bleaching agent on enamel bond strength. When the modes of failure were evaluated, all three types of failure, that is, adhesive, cohesive, and mixed were observed. More of adhesive failure's were seen with Group B, C1, D1 (60%) indicating the reduction of bond strengths between the tooth and the restorative material. However, the number of adhesive failures reduced after the application of sodium ascorbate hydrogel (C2-30%, D2-20%). Also, similar reduction in failures was seen with the increase in the duration of application of the hydrogel (C3-20%, D3-20%) [Table 4]. Within the limitations of this study, it can be concluded that the use of sodium ascorbate hydrogel following bleaching, increased the composite resin-enamel bond strength and the shear bond strength was directly proportional to the duration of application of the sodium ascorbate hydrogel. However, there was no difference in bond strengths on increasing the concentration of sodium ascorbate hydrogel. Hence, immediate bonding of composite resin to bleached enamel is possible after treatment with antioxidant sodium ascorbate hydrogel. 1. Matis BA, Cochran MA, Eckert G, Carlson TA. The efficacy and safety of a 10% carbamide peroxide bleaching gel. Quintessence Int 1998;29:555- 63. 2. Haywood VB, Robinson FG. Vital tooth bleaching with Nightguard vital bleaching. Curr Opin Cosmet Dent 1997;4:45-52. 3. Li Y. Biological properties of peroxide-containing tooth whiteners. Food Chem Toxicol 1996;34:887-904. 4. Christensen GJ. Bleaching teeth: Practitioner trends. J Am Dent Assoc 1997;128 Suppl:16S-8. 5. Titley KC, Torneck CD, Smith DC, Chernecky R, Adibfar A. Scanning electron microscopy observations on the penetration and structure of resin tags in bleached and unbleached bovine enamel. J Endod 1991;17:72-5. 6. Stokes AN, Hood JA, Dhariwal D, Patel K. Effect of peroxide bleaches on resin-enamel bonds. Quintessence Int 1992;23:769-71. 7. Garcia-Godoy F, Dodge WW, Donohue M, O'Quinn JA. Composite resin bond strength after enamel bleaching. Oper Dent 1993;18:144-7. 8. Bowles WH, Ugwuneri Z. Pulp chamber penetration by hydrogen peroxide following pulp bleaching procedures. J Endod 1987;13:375-7. 9. Attin T, Vollmer D, Wiegand A, Attin R, Betke H. Subsurface microhardness of enamel and dentin after different bleaching procedures. Am J Dent 2005;18:8-12. 10. Cvitko E, Deheny GE, Swift Jr, Pires JA. Bond strength of composite resin to enamel bleached with carbamide peroxide. J Esthet Dent 1991;3:100-2. 12. Kalili T, Caputo AA, Mito R, Sperbeck G, Matyas J. In vitro toothbrush abrasion and bond strength of bleached enamel. Pract Peroidont Aesthet Dent 1991;3:22-4. 13. Sung EC, Chan SM, Mito R, Caputo AA. Effect of carbamide peroxide bleaching on the shear bond strength of composite to dental bonding agent enhanced enamel. J Prosthet Dent 1999;82:595-9. 14. Cavalli V, Reis AF, Giannini M, Ambrosano GM. The effect of elapsed time following bleaching on enamel bond strength of resin composite. Oper Dent 2001;26:597-602. 15. Dishman MV, Covey DA, Baughan LW. The effects of peroxide bleaching on composite to enamel bond strength. Dent Mater 1994;10:33-6. 16. Türkün M, Türkün LS. Effect of nonvital bleaching with 10% carbamide peroxide on sealing ability of resin composite restorations. Int Endod J 2004;37:52-60. 17. Lai SC, Mak YF, Cheung GS, Osorio R, Toledano M, Carvalho RM, et al. Reversal of compromised bonding to oxidized etched dentin. J Dent Res 2001;80:1919-24. 18. Lai SC, Tay FR, Cheung GS, Mak YF, Carvalho RM, Wei SH, et al. Reversal of compromised bonding in bleached enamel. J Dent Res 2002;81:477-81. 19. Kimyai S, Valizadeh H. The effect of hydrogel and solution of sodium ascorbate on bond strength in bleached enamel. Oper Dent 2006;31:496-9. 20. Turkun M, Kaya AD. Effect of 10% sodium ascorbate on the shear bond strength of composite resin to bleached bovine enamel. J Oral Rehabil 2004;31:1184-91. 21. Rueggeberg FA, Margeson DH. The effect of oxygen inhibition on an unfilled/filled composite system. J Dent Res 1990;69:1652-8. 22. Torneck CD, Titley KC, Smith DC, Adibfar A. Adhesion of light cured composite resin to bleached and unbleached bovine dentin. Endod Dent Traumatol 1990;6:97-103. 23. Mccracken MS, Haywood VB. Demineralization effects of 10 percent carbamide peroxide. J Dent 1996;24:395-8. 24. Hegedus C, Bistey T, Flora-Nagy E, Keszthelyi G, Jenei A. An atomic force microscopy study on the effect of bleaching agents on enamel surface. J Dent, 1999; 27:509-15. 25. Mcguckin RS, Thurmond BA, Osovitz S. Enamel shear bond strengths after vital bleaching. Am J Dent 1992;5:216-22. 26. Titley KC, Torneck CD, Ruse ND. The effect of carbamide peroxide gel on the shear bond strength of a microfill resin to bovine enamel. J Dent Res 1992;71:20-4. 27. Rose RC, Bode AM. Biology of free radical scavengers: An evaluation of ascorbate. FASEB J 1993;7:1135-42. 28. Smit AJ, Anderson R. Biochemical mechanisms of hydrogen peroxide- and hypochlorous acid-mediated inhibition of human mononuclear leukocyte functions in vitro: Protection and reversal by anti-oxidants. Agents Actions 1992;36:58-65. 29. Brennan LA, Morris GM, Wasson GR, Hannigan BM, Barnett YA. The effect of vitamin C or vitamin E supplementation on basal and H 2 O 2 -induced DNA damage in human lymphocytes. Br J Nutr 2000;84:195- 202. 30. Kaya AD, Turkun M. Reversal of compromised bonding to the bleached teeth. Oper Dent 2003;28:825-9. 31. Carr AC, Tijerina T, Frei B. Vitamin C protects against and reverses specific hypochlorous acid and chloramine dependent modifications of low density lipoproteins. Biochem J 2000;346:491-9. 32. Zhao H, Li X, Wang J, Qu S, Weng J, Zhang X. Characterization of peroxide ions in hydroxyapatite lattice. J Biomed Mater Res 2000;52:157- 63. 33. Syprides GM, Perdigao J, Pagani C, Araujo MA, Syprides SM. Effect of whitening agents on dentin bonding. J Esthet Dent 2000;12:264-70. 34. Kalili KT, Caputo AA, Yoshida K. Effect of alcohol pretreatment on composite bond strength to bleached enamel. J Dent Res 1993;72:283. 35. Kimyai S, Valizadeh H. Comparison of the effect of hydrogel and a solution of sodium ascorbate on dentin-composite bond strength after bleaching. J Contemp Dent Pract 2008;9:105-12.
arumugam, m. and nesamani, r. and kittappa, k. and sanjeev, k. and sekar, m.
Thapa, A. and Vivekananda Pai, A.R. and Thomas, M.S. bassir, m.m. and rezvani, m.b. and chiniforush, n. and moradi, z.